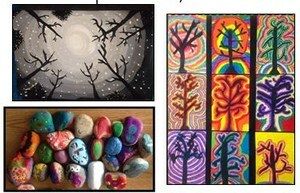 It is a pleasure to honor the “Arts” as we celebrate Youth Art Month in March. One student from each school will be selected to present their art to the Board of Education on March 20th, 2018 and the artwork will be displayed in the 9-R Board room for 1 year. Congratulations to Karina Trujillo whose art was selected this year! In addition to Art, we celebrate “The Arts” in general. At 9-R, we are fortunate the arts are valued and remain a high priority in education. We want to take this time to thank all of our teachers of the arts (Jean Owens and Deb Jackson) as well as our students who are the “artists” for brightening our educational day with their creativity.